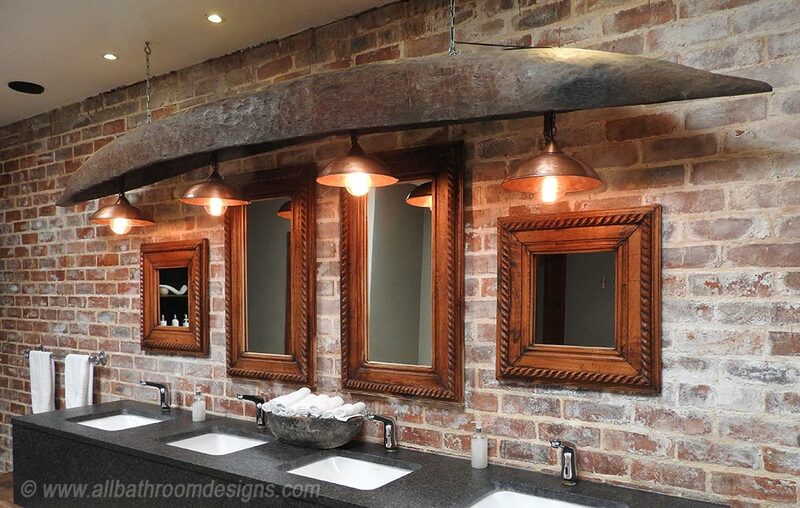 Use bathroom vanity lighting to dress up your bathroom like never before! While bathrooms are one of the most used parts of any house, bathroom lighting is often one of the most ignored aspects of it. If you have an intense desire (but just can't get to doing it) to do it up differently every time you step into your bathroom, perhaps some really creative bathroom lighting ideas can help you to illuminate the space optimally! Since you do most of your grooming at the bathroom vanity, it makes sense to have good lighting there. Depending on the size of your bathroom vanity, lights fixed on the sides of the mirror may not always be a practical choice. A classy alternative is to fix lighting fixtures directly on the large mirror. Though a lighted vanity mirror may be a bit more expensive, this option works like magic as it provides uniform light for your vanity area, as well as lending it an elegant look. If you have some wall space above your vanity, you can really let your imagination run free and use unexpected elements to enhance your lighting fixtures! In the image below a "Mokoro" dugout canoe is used to great effect, not only as an additional shade, but also as a design feature to lend unity to this vanity at Botlierskop Game Reserve. Task lighting is one of the most basic forms of lighting in any bathroom, allowing you to get your tasks done in sufficient light. Ornate mirror frames cry for accent lighting! Embedded lights or surrounded with lights is a matter of choice! 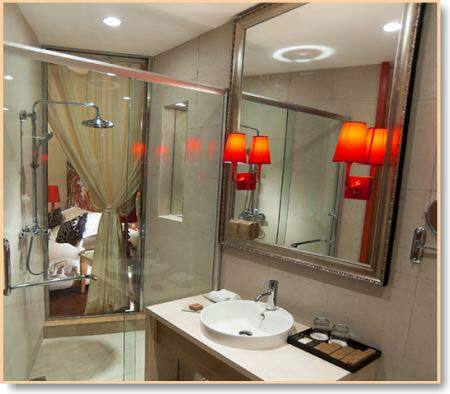 And if you match the style of the lights and the mirror, it will make an even bigger design statement. 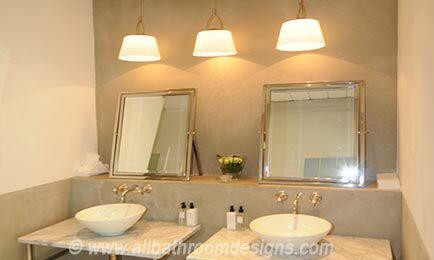 Bathroom vanity lighting like tracks and recessed fixtures are a good bet if fixed around the vanity as they allow you plenty of good light. Fixtures like wall sconces should be of generous width and are best fixed above your vanity so that you don't get any awkward shadows on your face. Not only are shadows unflattering, it is not the ideal illumination for applying make-up or shaving either. Wall mounted light fixtures fixed on both sides of the vanity mirror with the fixture's center focused at your eye level will ensure that you get uniform light. As a rule of thumb the average eye level is at about 66 inches or 165 cm. A distance of about 36 inches or 90cm apart works well for these lights. 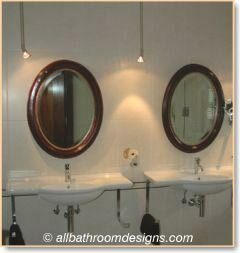 If the vanity mirror is very wide you could mount the vanity light fixtures directly on the mirror, which also serves to reflect the light to great effect. Using a dimmer to adjust the intensity of the light as required is an excellent way to keep up with your 'save energy' resolution and to transform task lighting into mood lighting. Bathroom vanities give you plenty of scope to create an atmosphere that you desire, that make you feel good, relaxed, as well as help you get your jobs done in a beautiful space. That's why we have created an entire article highlighting (pun intended) the importance of bathroom vanity lighting - offering some ideas for vanity light fixtures for you to explore. Surprised? Lamps work well in small spaces and since they are available in a wide array of designs and styles and colors, you'll always find pieces that match your existing bath decor. Create your own unique lamp by mixing and matching the base and the shade and make it a focal point of your vanity area! Remember, lamps create a warm, cozy and welcoming feel and those feelings are hard to resist! Note though that fabric shades are not ideal in high moisture areas. 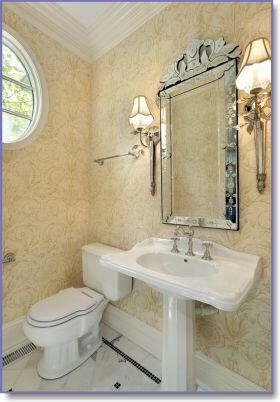 We like the idea of using track light fixtures around the vanity area. Track lights use LED bulbs that are available in many different colors like white, blue, green, yellow, red, etc. LED bulbs are energy saving and have a longer life than an incandescent bulb. The best feature of a track light is its flexibility. You can adjust the lights as per your convenience and requirement. 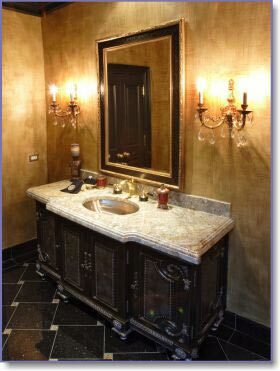 Moreover, track light fixtures that can be concealed easily are also a good way light up the vanity without any tell tale signs. Track lighting with its simple styling gives your vanity area a contemporary look. The ideal bathroom vanity lights emit light in the same spectrum as the sun. Try and avoid white and yellow bulbs as they will not give the same effect as sunlight, making it more difficult to know how you will look outside. Ask your lighting supplier about a special type of light bulb known as "neodymium light bulb". A neodymium bulb emits light that mimics sunlight very successfully. This incandescent bulb comes with an ever so slight bluish tint that is created due to the thin coating of neodymium on the inner side of the glass, ensuring that the bulb doesn't emit yellowish light. If you enjoy sparkling lights in your bathroom, then why not consider installing a chandelier? Chandeliers are quite a traditional choice for lighting, but they are ever popular because of their varied designs and styles. Crystal chandeliers are most expensive, followed by glass and the least expensive are available in wrought iron. 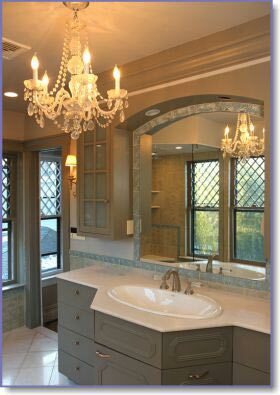 Chandeliers will give the bathroom and vanity area an elegant and classic look. Design Tip: Avoid using overhead lighting for your vanity as it's bound to cast unwanted shadows on your face. 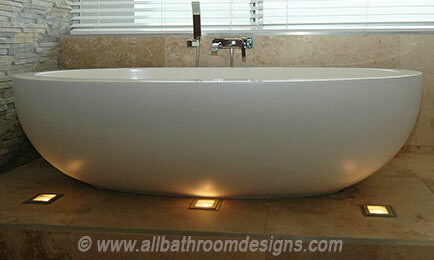 This is also one of the most common, but least effective forms of bathroom vanity lighting! However, if you have no other option than installing an overhead light fixture, we you can fix it at some distance away from the vanity area to reduce the formation of shadows. A good solution is illustrated in this image: The addition of recessed task lighting within the vanity surround provides task lighting without detracting from the beautiful ceiling light. Practical and innovative tips for task lighting as well as ambient, mood and Accent Lighting. Making Light Work with layers of light and the combination of exciting materials and elements. 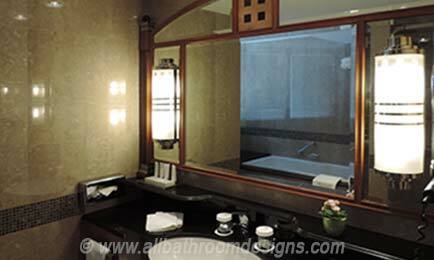 OK. We've established that finding the ideal bathroom vanity lighting is very important. So you need to spend time to work on the type of vanity lighting that will best fulfill your needs - and of course the look that you want to create. 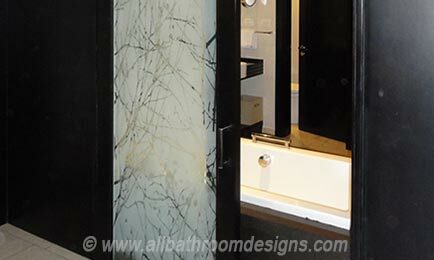 This is such a fun part of your bathroom design!